Winter arrives in Northern Michigan with great delight. Yes, it is time to hit the hills--the ski hills that is. Downhill skiing is a major activity for local residents through the winter months. And for visitors, well, skiing in Northern Michigan is so spectacular that you will come back again and again. 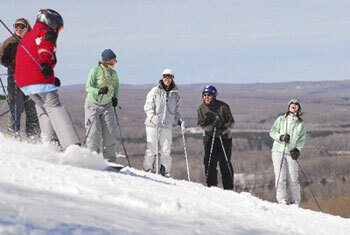 Northern Michigan is THE place in the Midwest to enjoy a variety of ski experiences. The Petoskey-Harbor Springs area boasts three ski resorts and each is spectacular: together they create a ski mecca. Skiing often begins Thanksgiving weekend and continues through Easter. Ski racing is alive and well in Up North with everything from weekend NASTAR to high school racing to adult league racing most week nights. On weekends and during winter school breaks or long weekends, visitors flock to Northern Michigan because we do skiing and snowboarding right. Our resorts--Nub's Nob, Boyne Highlands, and Boyne Mountain--have something for everyone: ski schools, gentle terrain, moguls, apres ski, black diamond runs, ski racing, and snow making. Yes, we do winter right. Nub's Nob What's not to love about Nub's Nob? 53 ski runs, fabulous snow making, snowboarding at its best, zip line, cross country skiing--including a lighted run--great food, wonderful service and snow making that is just tops. For more information, visit Nub's Nob.